All the Elliott fans are screaming P3, P3, P3, as if the market has crashed 20% or so last week. It obviously didn't, it actually dropped 2!% last week and 5% of the highs. What a drop! Well, to be honest, it's one of the biggest drop the bears have seen in the last six months (lol) but why are the Elliott Wavers seeing new lows in 2010/11? It's the wave count. We've come to a point where there aren't many possible wave counts left. 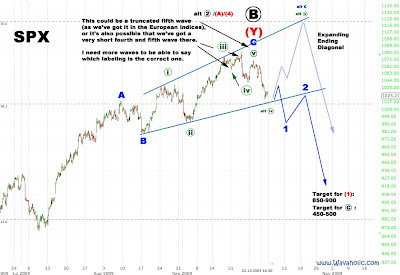 One of them and the most likely one is the bearish count, where the top is in and we are heading to new lows. The other two possibilities are on one hand an Expanding Ending Diagonal (shown as the alternative count in the chart below) and on the other hand a Triple Zigzag. Both of them are very very rare formations, so I don't think one of them will happen. Though I have to admit that the whole wave count would look nicer if it formed an Expanding Ending Diagonal.